If you are into Email Marketing, you must have definitely come across the names, Thrive Leads and Sumo. Of course, there are many other Lead Generation plugins available these days as well. As a matter of fact, these two plugins Thrive Leads Vs Sumo are certainly two of the most extensively used lead Generation tools. A lot of people are actually trying to figure out the actual differences between these two amazing plugins but just as in most of the Lead Generation tools, it is not possible to spot the actual difference until and unless you give them a good try. Hence, I decided to try both the plugins for a demo project and find out how these two tools differ from each other. The Sumo plugin (formerly known as SumoMe), offers comprehensive features and list building is one of its features, Most importantly, its usage is not just limited to WordPress and it can be used with Squarespace, Weebly and Shopify as well. If you consider pricing, the Thrive Leads plugin it offers you all the features for a one-time price. This does not hold true for the Sumo plugin and it actually is available a free plugin with limited features. However, you can upgrade it for advanced features by paying a membership fee. As far as my experience with Sumo is concerned, I thought the free suite of Sumo is powerful enough as it offers more than just lead generation. However, the only thing I found a little irritating is the fact that it kept on bugging me to upgrade my free account for a pretty high monthly fee and also, Sumo Pro membership is comparatively more expensive than that of the Thrive Leads. The Thrive Leads plugin is available in 3 packages; One License for $67, 5 License Pack for $97 and 15 License Pack for $147. When it comes to Sumo Pro, you can start for as low as $468/year for three sites and 100,000 hits. As far as opt-in forms are concerned, the Thrive Leads plugin certainly offer eight optin form types while the Sumo offers 5 opt-in form types. Another major difference that I came across is the design and customization aspect of the two plugins. I experienced a lot more freedom using the Thrive visual editor that comes with the Thrive Leads plugin. 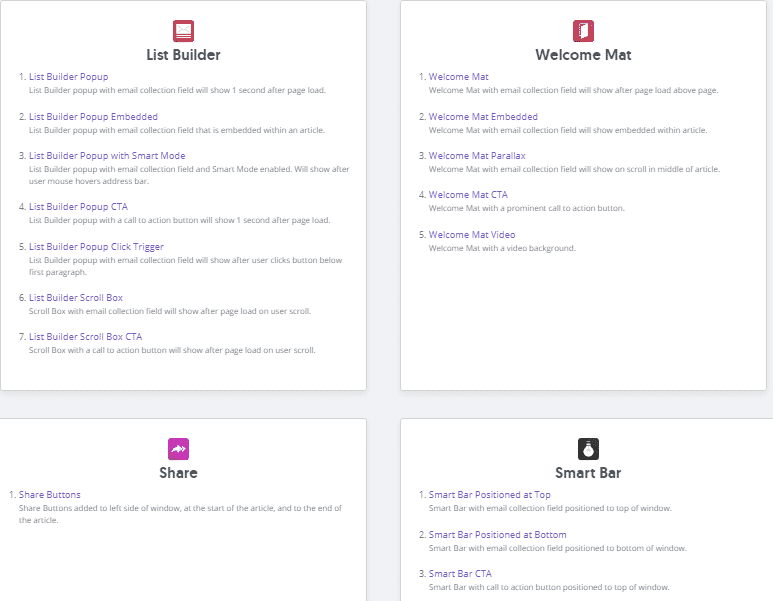 Also, it is pretty simple to use and it comes with 400 professional templates that you can use to build the most attractive as well as conversion optimized opt-in-forms with. On the contrary, Sumo offers a limited number of simple templates with a drag and drop option. However, as you compare it with the Thrive Architect visual editor, you will literally feel as though you are pretty much stuck with very limited options. As far as A/B Testing is concerned, I found the Thrive Leads to be a lot more effective than Sumo. 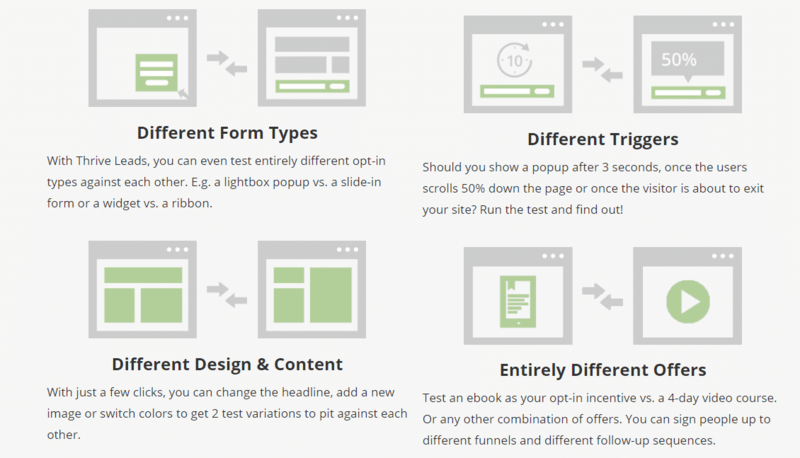 It allows you to A/B test all the various Opt-in form types with each other alongside allowing you to split test designs. It allows you to A/B test Page Load, Time, Scrolls to Specific Content, Scrolls to a Percentage of the Content, Page Bottom and Element Click Triggers as well. However, A/B testing in Sumo is merely limited to just Time and Exit intent. In addition to an excellent A/B testing, the Thrive Leads plugin makes a lot of room for traffic optimization and most importantly, it increases conversions by automatically hiding the losing variations. The Thrive leads plugin offers pretty advanced targeting and triggers on the basis of specific content interest on your website. Sumo Pro works a little differently and it actually uses targeting based on cookies to determine a visitor’s behavior and geographical location to customize the visitor's experience in a much meaningful way. However, you can’t afford to have this functionality with the free version of Sumo. This pretty much gives you a clear picture of the exact differences. The Thrive Leads plugin certainly offers great transparency in terms of pricing and features. What I liked the most about Thrive Themes is the fact that it has a onetime subscription with full features, unlike the Sumo Pro which bugs you to upgrade to the next higher plan to unlock more advanced features. Also, Sumo Pro can be a lot expensive if you are on a tight budget. It is never unwise to start with Sumo Free.